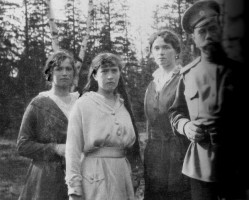 Nicholas Romanov, the deposed czar of Russia, and his family were awakened in the middle of the night on July 16-17, 1918, and told to get dressed. They were being moved to a safe location, their Bolshevik captors said, away from the White army that was closing in on Yekaterinburg, in the southern Ural Mountains. The soldiers shepherded the family and four servants—a cook, valet, doctor and maid—into the basement of the house where they were being held. Nicholas carried his ailing son, Alexei, in his arms. Once all were assembled, a death sentence was read aloud, twice, and the eight executioners raised their guns. Precisely what happened next took Soviet and Russian investigators nearly a century to piece together. Now the results of those investigations, the last of which was closed last year, are the subject of an ambitious exhibition at the Russian State Archives in Moscow. “The Death of Tsar Nicholas II’s Family: A One-Hundred Year Investigation,” through July 29, aims to clear away seven decades of misinformation and silence under the Soviet regime. “The Soviet government hid all of this true story from the people for so long,” said Diana, a 22-year-old student, who said she was struck by the savagery of the execution, which ended in a bayonet charge. The truth presented here is an ugly one. 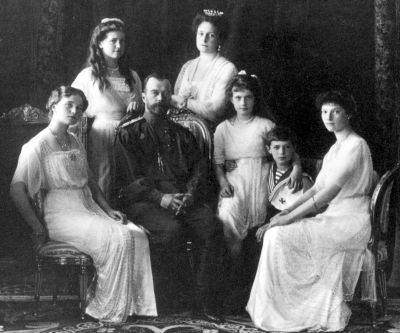 “None of the Romanovs were saved on that terrible night, and all the remains of the family and those who were with them have now been accounted for,” said Sergei Mironenko, director of the Russian State Archives and co-organizer of the exhibition. There were, in other words, no romantic escapes, no jaunting through Europe, no hidden riches—not even for Anastasia, at 17 years old the youngest duchess, whose purported survival has inspired numerous films and theater productions. The executions closed the door on the 300-year-old Romanov dynasty and foreshadowed years of violence to come under Bolshevik rule. But silence from the Soviet government—a single line in Pravda, “Nicholas Romanov has been executed. His family has been evacuated to a safe location,” is all that the Soviet government had to say on the matter until 1991—led to rumors that the family had survived and gave rise to scores of imposters. “Not even Nicholas’s mother and sisters believed he was dead,” Mr. Mironenko said. State investigators went to extraordinary lengths to determine what happened in the basement of the Ipatiev House and how the executioners disposed of the bodies. “DNA tests, mitochondrial DNA tests, dental exams, anthropological studies, situational studies and trace-material studies. You name it, they did it,” Mr. Mironenko said. Many of the results of these studies are on display, including a map of the murder scene that shows where the participants stood, how they moved around the room, and where each bullet fell. The exhibition also includes rare artifacts from the first investigation, conducted in 1919 after the Whites captured Yekaterinburg, such as part of the jaw of the Romanovs’ family doctor, Yevgeny Botkin; the investigator’s notebooks; and bullets found in a shallow mineshaft where the bodies were initially dumped. “This is essentially the first time that Russians have a chance to view these items, which recount a tragic page in Russia’s history,” wrote Friar Vladimir von Tsurikov, dean of Holy Trinity Seminary in Jordanville, N.Y., in an emailed message. The seminary contributed a copy of the 1919 report and other artifacts. Although memories of the Soviet Union have grown rosier under Vladimir Putin, a proud former KGB agent, many Russians see the Bolshevik Revolution as the start of a 70-year detour from their nation’s path to becoming a developed, Western European-style state—”a normal country,” as they like to say. For them, the Romanovs’ death predicts the violence and misery of the Civil War, the Stalinist era and World War II, and provides fertile ground for counterfactual fantasies in which the monarchy or the progressive government that overthrew it survives. No Gulags, no purges, no terrors, maybe. Not all Russians have accepted the results of the state’s investigations. The most peculiar and powerful skeptic is the Russian Orthodox Church, whose influence has grown in recent years with the strong support of Mr. Putin. For reasons that are not widely understood, the Russian Orthodox Church does not recognize the authenticity of the remains that have been discovered. It instead favors the version put forth by the original investigator, Nikolai Sokolov, who in 1919 argued that the royal family’s remains had been completely destroyed. Their resistance drives Mr. Mironenko to despair. “I don’t understand it. There are some reasons here. I don’t know. I don’t understand them at all,” he says with visible agitation. Russian Orthodox Church spokesman Vsevolod Chaplin said by telephone that he couldn’t give details about the church’s remaining objections to the state’s evidence, except to say that there were still unanswered questions. In 1998, the remains of Nicholas, his wife Alexandra and three of their daughters were reinterred in the Peter and Paul Cathedral in St. Petersburg beside their royal ancestors. 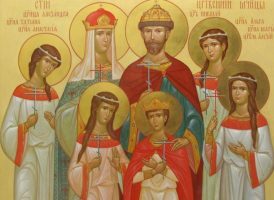 Two years later, the royal family was canonized by the Russian Orthodox Church as “passion bearers,” a classification similar to martyr. The Russian Orthodox Church outside Russia recognizes the family as martyrs. But the remains of Alexei and Maria, which were discovered in 2007, have not yet been reinterred and are unlikely to be without the church’s support. “No one wants to see a repetition of the original burial of the Romanovs remains, when the Russian public witnessed a disconnect in the assessment,” Friar Vladimir wrote. Viktor Aksyuchits, a Christian-monarchist politician who led the government commission that identified and buried the remains discovered in 1991, says this completely undermines the exhibition. “On the one hand, it’s a big deal that the state archives decided to hold this exhibition. On the other hand, we’re still waiting for the government to make a decision about burying the others. 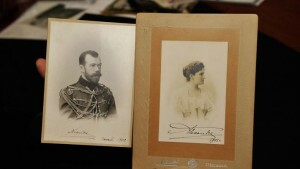 The remains of Alexei and Maria are still lying in a box somewhere in the State Archives,” he said by telephone. The exhibition ends, rather unexpectedly, on a cheerful note: a room of family photographs and a film reel of the family at play: Nicholas—by most accounts a loving father and husband—and Alexandra sit across from one another in the cockpit of a boat, staring lovingly into each other’s eyes; Nicholas shoveling sand over his giggling son; Grand Duchess Tatiana giving a cheeky wink to the camera in a portrait with her sisters and a young mustached sailor. It is a reminder that while they were a royal family, they were also a family. Sermon by Metropolitan Anastassy (Gribanovsky,+1965) on the day of the martyric death of Tsar.